2016 has been a great year for me crying like a baby at the movies, and Disney’s remake of Pete’s Dragon is no exception! As a huge fan of the original, to the point of memorizing and frequently singing the songs from it, I was, at first, disappointed when I heard that this remake was to be a non-musical adaptation, let alone set in the present day. As the release date drew nearer, I read interviews with the cast and crew that eased my doubts, and the final trailer had me hooked. In the end, I’m so glad at how well the remake is put together, rid of winks and nods to the original (as was the director’s intention) and crafting a wholly new experience that brings to mind the best of the adventure movies of the 1980’s. The story opens succinctly – Pete, at age 5, is the sole survivor of a car crash while his parents are going with him on a camping trip. Alone in the forest, he becomes acquainted with a huge dragon, who seeks to protect him. 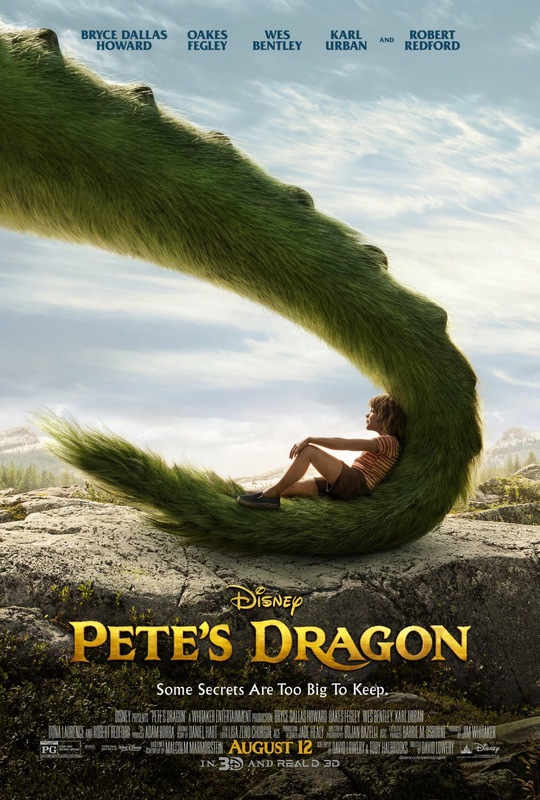 Six years pass, and Pete (Oakes Fegley, This Is Where I Leave You) and his dragon, whom he names Elliot, are best of friends, enjoying their lives of fun and play together. Meanwhile, in the nearby town of Millhaven, a logging crew, led by brothers Gavin (Karl Urban, Star Trek Beyond) and Jack (Wes Bentley, Interstellar), draws nearer to the protected parts of the forest, while a park ranger named Grace (Bryce Dallas Howard, Jurassic World) seeks to keep law and order between the two, and all the while, the children of the town are driven by the stories of dragons in the forest told by Mr. Meecham (Robert Redford, Jeremiah Johnson). All of these people will meet through the one thing nobody seems to believe in! In addition to me sputtering like a faucet, 2016 is also a great year for actors, particularly children — Oakes Fegley brings the requisite euphoric glee when around Elliot to showing great fear and wonder when taken away from him. Further, child actress Oona Laurence (Southpaw) is charming as Natalie, Jack’s daughter, instructing Pete on the ways of the world he has missed out on with warmth and kindness. While they do carry the heft of the film’s emotional weight, the adults in this film do not rest on their laurels at all, best shown by Howard and Redford, as a daughter and father looking to believe in stuff most left to childish fantasy and getting far more than they bargained for. Wes Bentley and Karl Urban also do great work in their roles, with Bentley showing a warmer side than I’ve seen from him in his previous films, while Urban, the ultimately misguided villain of the story, being mean but never truly evil, which is how it should be; his character is not a mustache-twirler. The film is gorgeously shot in the home of Middle-Earth, New Zealand, and by no less than cinematographer Bojan Bazelli (The Sorcerer’s Apprentice), who shows off the best of the land in a way that enhances the believability of the story and the great visual effects by the amazing artists at Weta Digita, who make Elliot’s fantastic self seem real and breathing, and only help the raw emotions you as an audience member feel throughout the course of this movie. Ultimately though, the best kudos have to be given to writer-director David Lowery and co-writer Toby Halbrooks, who could easily have plagiarized the previous film’s material and instead crafted a harrowing, beautiful experience that doesn’t leave a dry eye in the house. Between this and The Jungle Book, Disney is on a roll with its live-action ventures! I look forward to what Lowery and Halbrooks bring to their upcoming remake of Peter Pan, also at the House of Mouse. Until then, see this movie and you will leave feeling happy to be alive!